The story of the Otford branch of the Polhill family began in 1554 when David Polhill of Detling in East Kent purchased Broughtons from the Crown, (Mary Tudor). This added to the not inconsiderable acreage in the Darent valley already owned by his family. David was 28 at the time and two years later married Ales Sandbach who was also from East Kent. In Tudor times Broughtons was a 14th Century hall house, one of a cluster of houses round the mill and the river. Others still standing are at the other end of the High Street grouped round the Church and close to the Palace. Even in those days there was concern about the state of repair of Otford Palace and, in 1573 a survey was initiated by Sir Henry Sidney, Queen’s steward of Otford and father of Sir Philip, with David the chief juror of the commission along with his brother-in-law George Multon of St Clere near Heaverham, also a major land owner in Otford. However, repairs were not agreed and by 1600 material was being removed from the Palace for use elsewhere. David (1526-1577) and Ales (1530-1585) are commemorated by the oldest Polhill memorial, a simple floor slab in the chancel floor tucked behind the choir pews by the vestry door. As the Palace crumbled the fortunes of the Polhills rose and they moved up the social scale to become gentry. On David’s death, his son John (1558-1614) became the tenant of Broughton and by the end of Queen Elizabeth’s reign he owned 820 acres of farmland, including a third of Otford’s good agricultural land and some in Shoreham. John and his cousin Thomas Polhill were listed in 1580 as paying wool tithes, an insight into the local agriculture of the day. John enlarged Broughtons by adding a pair of gables making the house more fitting to his improved status. John was succeeded by his son David (1577-1658), whose arms appear in a small north window in the Nave. He became Sheriff of Kent and the wealthiest payer of poor rate in Otford. He was succeeded by his son John (1605-57), then on John’s death the estate passed to his eldest son David (1633-65) who bought Chipstead Place, where he preferred to live, it being a more substantial house with 26 taxable hearths against the 6 of Broughtons. David had no children and his brother Thomas (1636-83) inherited his property but sold Chipstead Place preferring Otford. Their sister Ann married George Petty who owned Colets Well while their brother Robert (1641-99) was a Churchwarden in the village. Thomas Polhill and his siblings were born in the reign of Charles I, the oldest of them being a boy of sixteen when the King was beheaded in 1649 and Oliver Cromwell established his Protectorate. They all survived this period of austerity and lived to see the monarchy restored and the beginning of the new age of music, art and architecture. Thomas married Oliver Cromwell’s granddaughter Elizabeth Ireton of Shoreham in 1666, the year of the great fire of London. It is to their children and their successors that we owe the Polhill memorials and hatchments found in St Bartholomew’s Church, no doubt a reflection of the prosperity and flamboyance of the Jacobean and Georgian ages. Thomas’ eldest son David participated in national affairs and was also a JP for Kent. When in 1701 the House of Commons did not support William III in his opposition to Louis XIV of France accepting the Spanish throne, the Kent Justices drew up a petition asking Parliament to give William the military resources he needed. David Polhill was one of the petitioners and was briefly imprisoned for his pains. The petitioners became national heroes and were soon released. Unfortunately war with France was not avoided. In 1 708 David became one of two MPs for Kent, a position he held for twenty-five years and also Keeper of the Records in the Tower of London. Thus a more elegant residence was felt necessary and in 1711 Chipstead Place, which had recently been rebuilt, was re-purchased for the family. 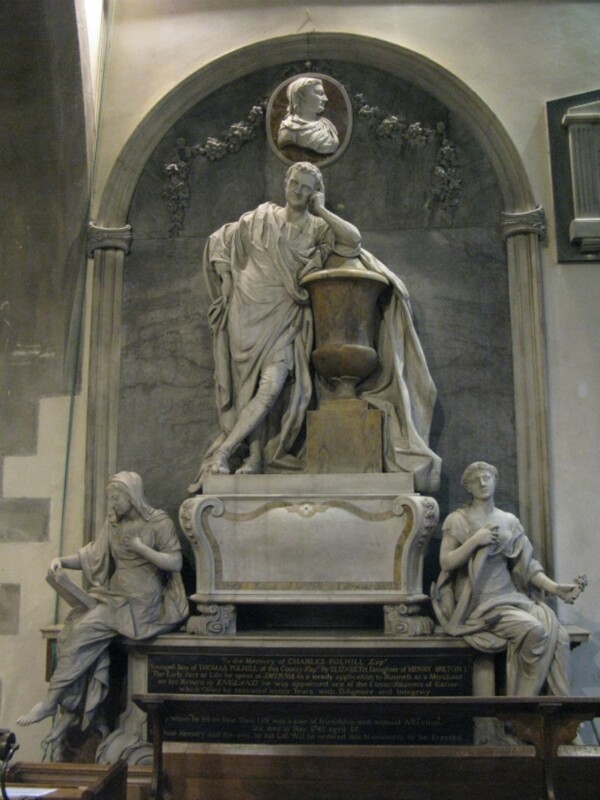 The monument to David the Petitioner (1674-1754) by Sir Henry Cheere is found on the south wall of the Nave, and was commissioned by David’s wife, Elizabeth Borrett, and his surviving children. T he largest Polhill monument is for Charles (1679-1755). 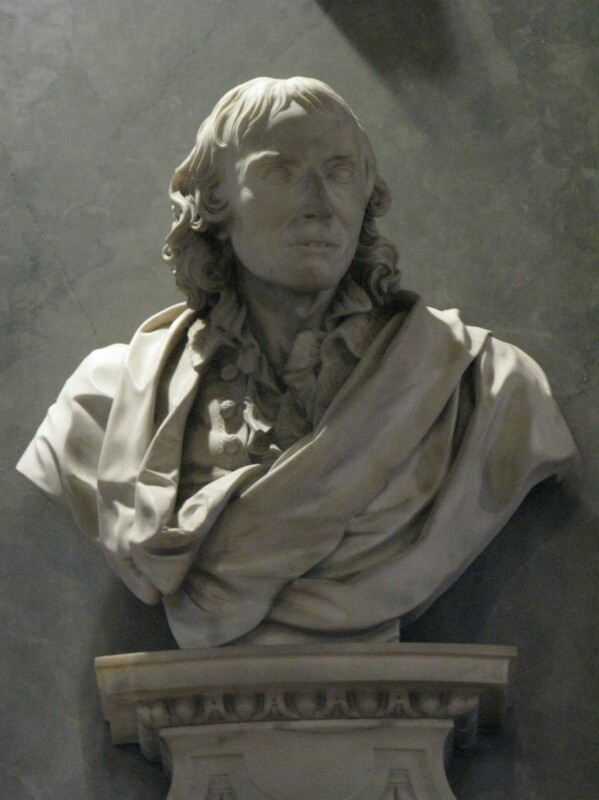 It is by Sir Henry Cheere who also sculpted the monument for Charles’ brother, David, which we featured last month. Charles was a successful merchant in Smyrna (modern Izmir) and later became commissioner of excise in England: altogether a lucrative career. His monument dominates the north wall of the chancel and it is reckoned to be a fine example of English Rococo. Charles is depicted as a life-size figure in a Roman toga. The two female figures are Faith, reading a Bible, and Hope who is holding an anchor and a posy. Charles’ wife, Martha (daughter of Thomas Streatfeild of Sevenoaks), is depicted in a profile bust placed under the top arch of the monument. Charles’ nephew (his brother David’s son) was also called Charles (1725-1805). He remodelled Broughtons around 1790 and Charles’ son George sold it and Chipstead Place in about 1830. Chipstead Place was demolished in 1930, but Broughtons still stands, having served as a family house for the Wreford family in the late 18th century. The monument to this later Charles was sculpted by J. Bacon of London and commissioned by his surviving children and sister and is located on the south wall of the sanctuary. He was married twice. His first wife was Tryphena Penelope Shelley of Mitchelgrove in Sussex who gave him one daughter, Tryphena Penelope. His second wife was Patience, daughter of Thomas and Sarah Hasswell of Woodmanston, Surrey. She left six sons, including George, born 1767 and a daughter. 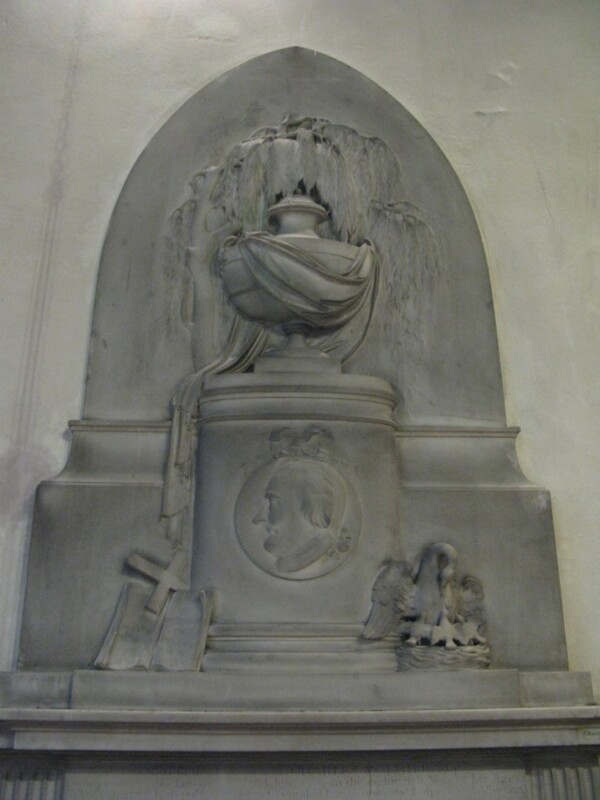 The last Polhill monument in the church is to George, (1813-92) who was a youn ger son of George, (1767-1839) and his wife Mary Porteus, and thus grandson of the Charles whose memorial we featured last month. George was a magistrate, and generously left £500 in trust to provide an annual income for the benefit of the village poor. 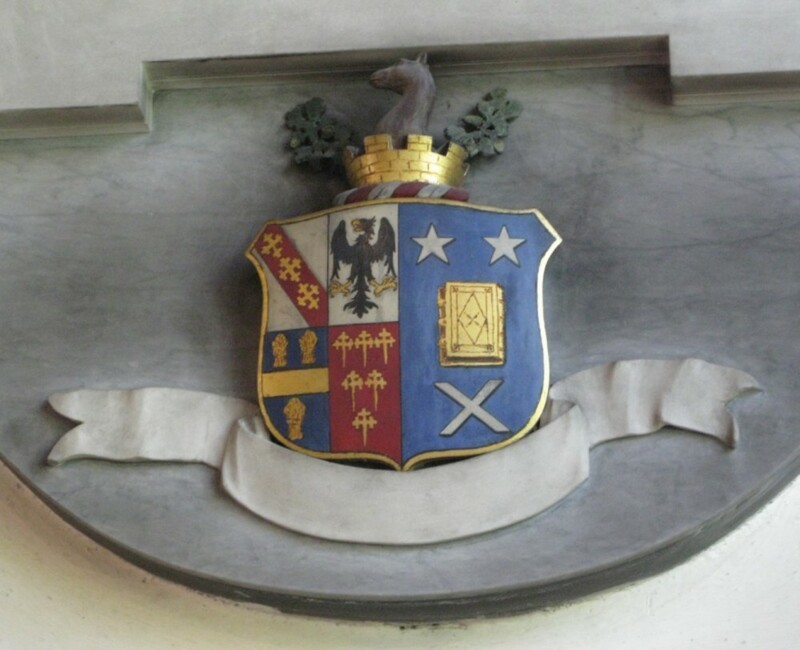 His memorial on the north wall of the sanctuary shows the Polhill Arms and crest. His older brother Frederick was a curate in Otford. The Polhill family vault can be found in the churchyard beneath the east window. The Polhill family no longer resides in Otford but their monuments remind us of the three hundred years during which they were members of the parish.